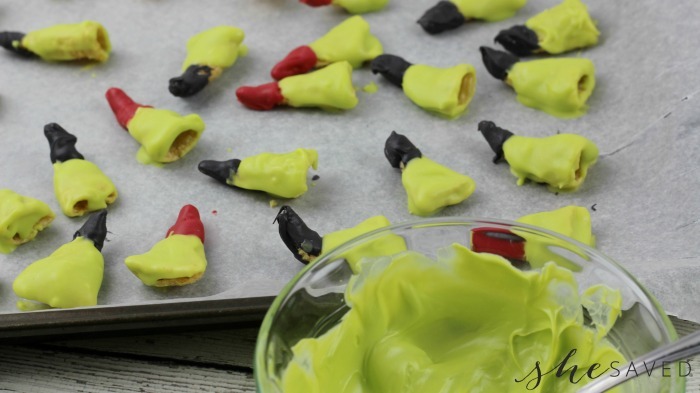 Here’s a fun (and easy) Halloween snack to make! The kids will enjoy making (and eating!) 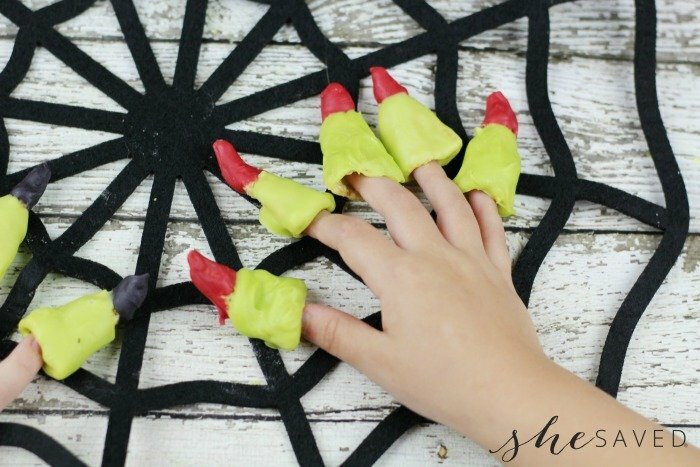 these cute little Bugle Witch Fingers and they will also add to any spooky party decor! Aren’t these the funnest? My kiddos sure think so! 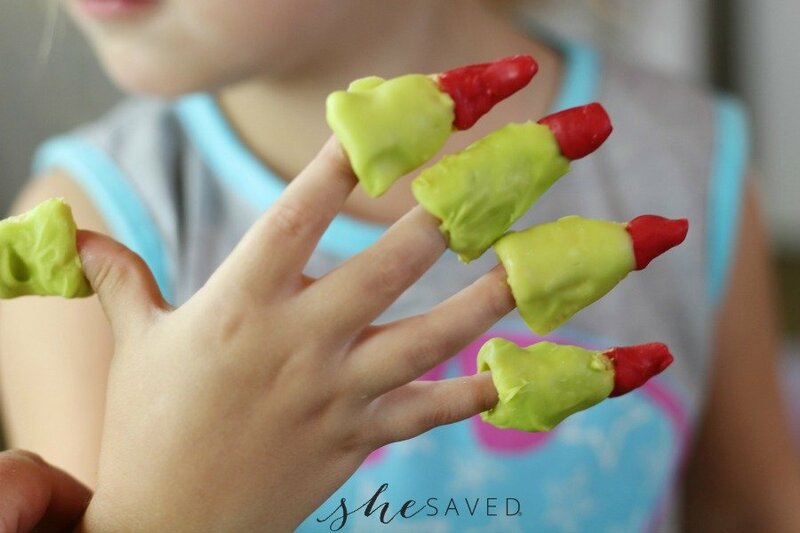 They love bugles without all the chocolate and every since they were toddlers they have loved putting them on their fingers like fingernails, so these fun Bugle Witch Fingers are a big hit around here. 2. In a microwave safe bowl, microwave the black chocolate melts for 45 seconds. Remove from microwave and stir. Place back in microwave and heat in additional 10 second increments, until melted. 3. 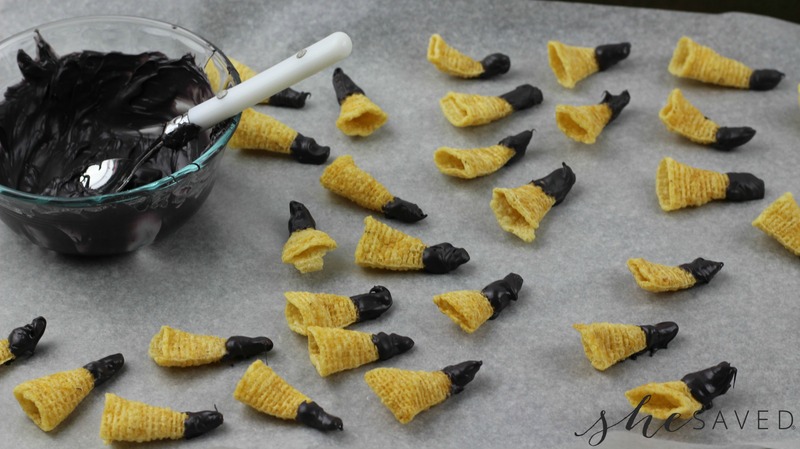 Dip the tips of half of the bugles into the melted black chocolate and place on the cookie sheet to harden for at least 15 minutes. 4. In another microwave safe bowl, microwave the red chocolate melts for 45 seconds. Remove from microwave and stir. Place back in microwave and heat in additional 10 second increments, until melted. 5. Dip the tips of the rest of the bugles into the melted red chocolate and place on the cookie sheet for 15 minutes to harden. 6. In a microwave safe bowl, microwave the shortening for 45 seconds. Remove from microwave. Add the green chocolate melts and stir until smooth and melted. 7. 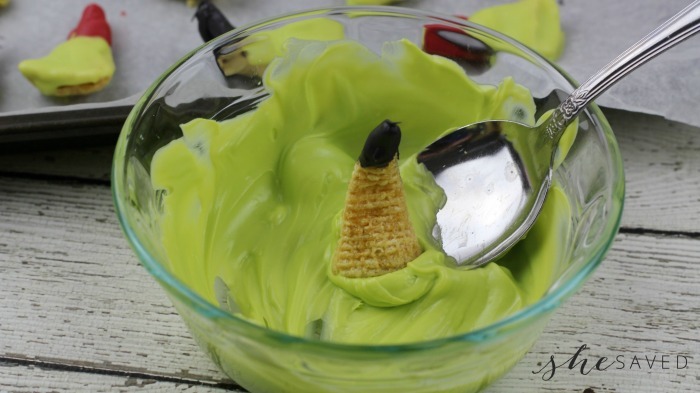 Dip the non-coated end of all of the bugles into the melted green chocolate. Place back on the cookie sheet for 30 minutes to allow the chocolate to harden. 8. 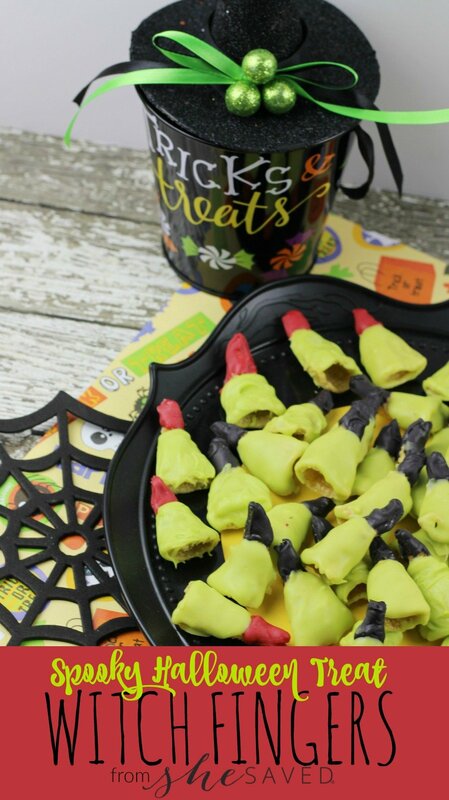 ENJOY your cute little Bugle Witch Fingers! So fun, right? 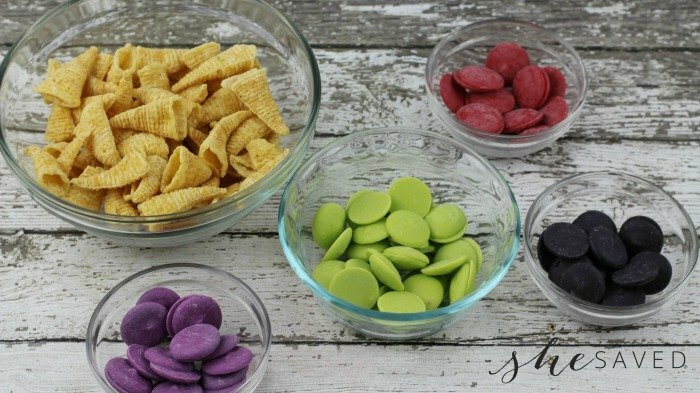 Kids make the holidays so fun and little things like these snacks are all part of the joy and imagination of childhood. I have to admit, I even love putting on a few witch finger treats and eating them off one by one! « FLASH SALE: 33% off Your Purchase at Pura Vida! Yes! I love an excuse to play with my food! 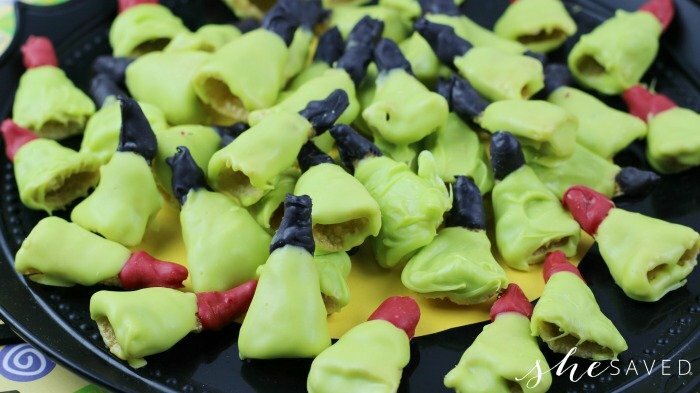 These are such a fun and perfect treat for a Halloween party! Thanks for sharing your recipe with us at Merry Monday this week!